Evolution Voice service powered by global UCaaS platform leader. According to recent news, the BroadSoft platform on which our Evolution Voice service is provided, has been identified by IHS Markit as the global Unified Communications as a Service (UCaaS) platform leader. 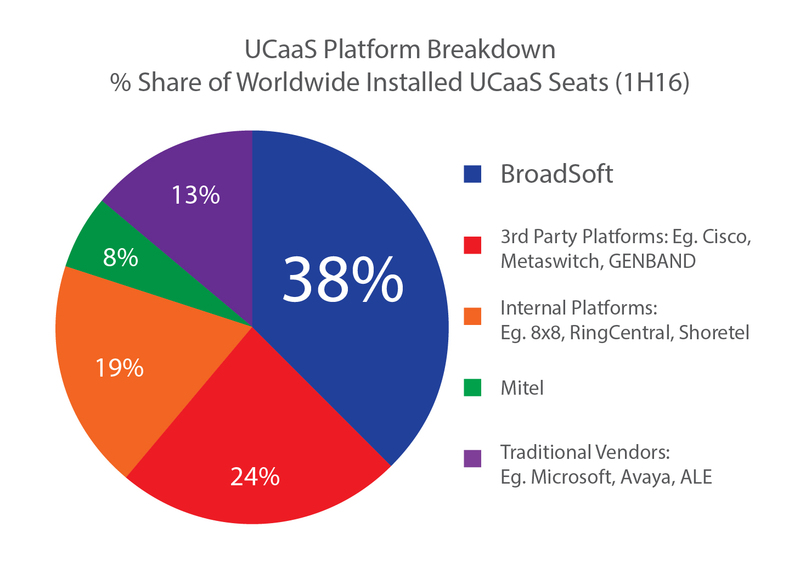 With 38% of the total worldwide UCaaS seats running on its platforms, as of the second quarter of 2016, the IHS study places the BroadSoft UCaaS global market leadership position ahead of its closest competitors. According to senior research director of VoIP, UC, and IMS for IHS Markit and author of the fourth quarter 2016 Analyst Insight report, Diane Myers, the UCaaS market today is comprised of a mixture or pure-plays, network operators, cable MSOs (Multiple System Operators), ISPs (Internet Service Providers), system integrators, and traditional premises-based vendors, which can be confusing for businesses trying to find the right provider and service to fit their needs. The IMS report and the data indicates, the leader is BroadSoft, comprising the larger share of installed base seats running over its platform. In November 2016, BroadSoft announced it surpassed 15 million cloud UC lines deployed globally, – an industry leading milestone three times greater than the next nearest competitor. At the same time, BroadSoft market share for new cloud UC line shipments is double that of the next closest competitor, a key trend as BroadSoft expects the market for new cloud PBX/unified communications will surpass on-premise PBX/UC equipment shipments by 2020. According to the IHS report, BroadSoft see UCaaS as also moving upmarket to large enterprises, and towards multi-tenant cloud solutions that now dominate cloud telephony/UC deployments. As businesses move away from premises-based PBX and UC vendors in favour of cloud alternatives, BroadSoft believes that it is strongly positioned to capitalise on this movement through authorised partners, such as Fourteen IP. Taher Behbehani, chief digital and marketing officer, BroadSoft commented saying, “Amongst a host of competitors, including the top third party platforms, internal platforms and traditional vendors, BroadSoft has emerged, based on this IHS report, as the global cloud unified communications leader as a multi-tenant UCaaS. This strong market position has helped Fourteen IP develop and deliver its above property hosted telephony service for the hospitality sector, which is now live in 13 countries and being rolled out to leading hotel brands across the UK, Europe and The Americas. Click here to read the article in full and download the IHS report.